Robots are always something that are worth checking out, especially those super huge ones that can change their form factor depending on the situation. Who can forget the SDF-1 from Macross? That was one bad mother, and we have also our fair share of giants from Japan including the Transformers and Voltron. 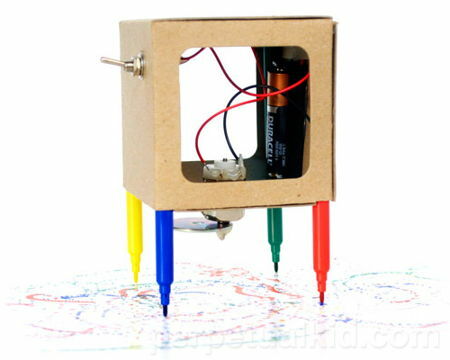 Here is something a little bit closer to home – the $26.29 Scribbler the Drawing Robot kit which allows you to build your very own robot without having to go to university beforehand and obtain an electrical engineering degree. With the Scribbler the Drawing Robot kit, you will be able to build, learn and play at the same time. After all, aren’t the most effective learning experiences the ones that you play? All you need to do to set it up woud be to follow the downloadable instructions, and you will then have your Scribbler the Drawing Robot up and running in no time at all. The motor of this robot will shake, where it makes the device dance around on the markers so that it churns out some great looking abstract art which will most probably not go p in value after the robot breaks down and is recycled. Some assembly is required for this electronic and construction kit, and you will also need to get your own hot glue gun as well as glue before putting it all together. A solitary AA battery would allow the Scribbler the Drawing Robot to churn out the next robotic masterpiece.